For Asian-Americans, food is integral to culture. Asian-American food is intrinsically woven into Asian-American identity and communities. Asian-American food is a conversation, one that spans countries, counters, and generations. Food is a way to communicate, a harmony of heritage. Asian-American food is one of the most intimate parts of Asian-American culture. It is a gathering of family. It is familial consumption. It is an appreciation of prosperity and a thankfulness of blessings. Cooking an Asian-American meal is a prayer, a harmonization of ingredients and techniques. Through Asian-American dishes, the self as a person and the self as a culture are made one, and made whole. This is not only a weaving of stomachs, but a weaving of hearts and souls. This isn’t an assertion of authenticity. Authenticity, after all, is subjective. This is a celebration of the essence of Asian-American culture in the kitchen. This is an investigation of the essentials of Asian-American cuisine, the driving characteristics, and the profundity of Asian-American tradition. Asian-American meals foster a blending of cultures, a gathering of family, and a respect for both history and the environment. In an Asian-American kitchen, there is a broad harmony of cultures and histories that span centuries and countries. Each dish created in an Asian-American kitchen evokes something of the past, something of the people far away from here. Cooking curry is a connection to India. Incorporating nan and chapatie is a connection to Pakistan, Sri Lanka, and Burma. 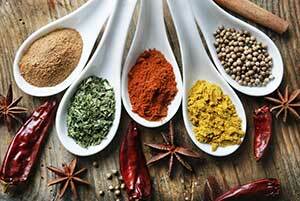 Should the meal indulge in strong spices, hot peppers, or ghee then the dish extends into Turkish culture. This: a meal that spans Southwest Asia–a rich, layered flavor of India, Burma, Turkey, Sri Lanka, and Pakistan enjoyed in kitchens across America. You can find the heritage and cultures of Brunei, Thailand, Malaysia, Laos, Singapore, Vietnam, and Cambodia in aromatic stir-fry, in steamed dishes garnished with subtle spices, meals boiled in citrus juices and light herbs. Sushi: a raw connection to Japanese harbors and docks, to their devoted workers, and historic struggles. Kim chi: a hot, roiled connection to the chili spices and grills of Korea. For the Chinese, food resolved the soul and protected the body from weather: in South China, a fresh tenderness to combat the heat; in North China, rich savory oils and garlic to buff against the cold. For some Asian cultures, spices and seasonings are medicinal, carrying with them a healing quality, a blessing of a long, fulfilled life. This is a form of transcendence. An intimate consumption of heritage that nourishes and blesses. Asian meals are comprised of a sharing of cuisines, of an influence of the earth and heritage. 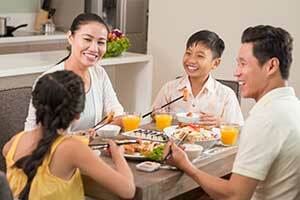 This harmonization of different cultures through food is the essence of Asian-American meals. The blending, the creation of Asian-American meals was an organic one. America was founded as a melting-pot, as a beautiful amalgamation of people from so many different cultures, heritages, countries, races, and religions. No wonder, then, that America so strongly embraced Asian cuisine. The melody of cultures now spans continents and oceans, combining and enriching meals from so many storied pasts. Americans are also driven toward socialization, toward the gathering of family and friends–Asian meals feed the stomach with food, feed the soul with togetherness. So, in a way, Americans may have turned toward Asian cuisine as another avenue of familial celebration, as another way to remember where we’ve come from and where we’re going: what we bring to the table is what nourishes the heart. The most beautiful part of this flavorful blend of Asian-American foods is that it varies across the country. Asian-American food crafted in Texas is not the same as Asian-American food crafted in New York. With Asian-American food, there are virtually endless possibilities for culinary creation and craft. Staples from across the country are adapted and folded into Asian cuisines centuries-old. The contrasting textures and flavors enhance and deepen the dish, creating combinations that wow and delight. Asian cuisine emboldens American cuisine–American meals are inclined toward segregating tastes, isolating flavors and textures while Asian meals blend the sweet, and the sour, and the savory, and the spicy. What results is a daring dish with full-bodied flavors, with a beautiful palette of spices, and a limitless range of ingredients. American staples like BBQ, corn, avocado, and potatoes, were absorbed into Asian-American dishes–and so we have kimchi quesadillas, Korean BBQ, Korean BBQ tacos. Asian-American cuisine even tackled the heart of classic Americana by offering a deliciously fun take on the hamburger by serving teriyaki chicken on a rice bun. Asian-American cuisine is a flavorful workshop that has given us chop suey, egg rolls, and even the iconic fortune cookie. Asian-American cuisine has also been the major, driving influence in the incorporation of Asian preparation techniques in the kitchen.The wok and cleaver are both common fixtures across most American households thanks to Asian-American culture. Even phrases like “Stir-Fry-Day” have entered into American lexicon. They are familiar to Americans, and to American kitchens, inviting more families to investigate and indulge in Asian-American meals. Even the invention of the chork (a utensil combining chopsticks and a fork) is an invitation, a welcoming, an opportunity to embrace and harmonize with another culture. Today, there is a new, fresh wave of Asian-American cuisine that is genuine, earnest, and personal. This is not the Asian meals offered by the immigrants of the past, cultivated and doctored to best suit what Americans would desire–nor is this the resulting backlash that pushed Asian-American kitchens to fight for authenticity over all else. Asian-American food today–with its beautiful cacophony of influences and orchestra of flavors–is a direct reflection of the personal experience of the cook. The distinct personal struggles, stories, and lives of Asian-Americans is being told through food. This is both an observance of individuality and of community, a reflection of inspiration, culminating into a succulent representation of how cultures and continents blend together into a single person–and the meals they make from their roots and with their souls. If you’re interested in learning more about the unique duality of Asian-American culture, be sure to check out our friends over at Bicultural Mama, a wonderful resource for all things related to parenting and inter-culturality.